I'm looking into Harmonic Elimination Pulse Width Modulation (HEPWM) and it requires a bit of maths. So although there isn't anything too exciting in this post, it's laying the groundwork for some future content. 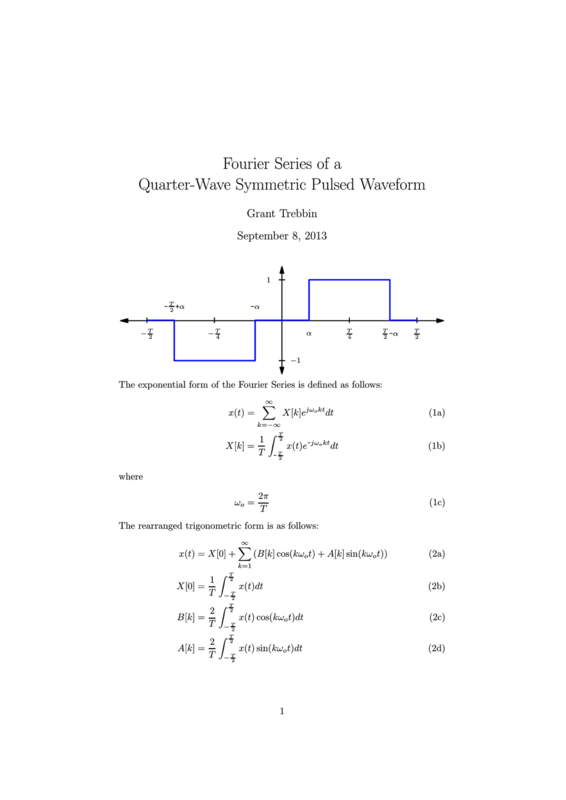 HEPWM is a technique to control the magnitude of harmonics in a PWM waveform. It takes the basic PWM process that most people are familiar with and tweaks it to allow control of the magnitude of harmonics in the generated waveform. It's used in a couple of places, but it's biggest use is calculating switching waveforms in DC to AC inverters. By switching a DC voltage in the correct sequence, you can push the harmonic distortion in the switched waveform into higher frequency harmonics. This doesn't seem too useful at first but it allows the use of smaller passive filters on the output to remove distortion. As the distortion is in higher frequency harmonics, the filters can be more basic with a gentle roll-off. One of the methods used to generate HEPWM waveforms is based upon Quarter-Wave Symmetric (QWS) Pulsed Waveforms. The Fourier series of the waveform is needed to do further calculations, so I've started at that point. Although I've only calculated the Fourier series for a very basic QWS Pulsed Waveform, the Fourier series of any QWS waveform can be generated by summing scaled versions of the basic Fourier series I've calculated with different parameters.